Our experience tells us that, in many cases, a novice entrepreneur needs some help in understanding the finer points of technology commercialization, and in learning the "language of innovation." 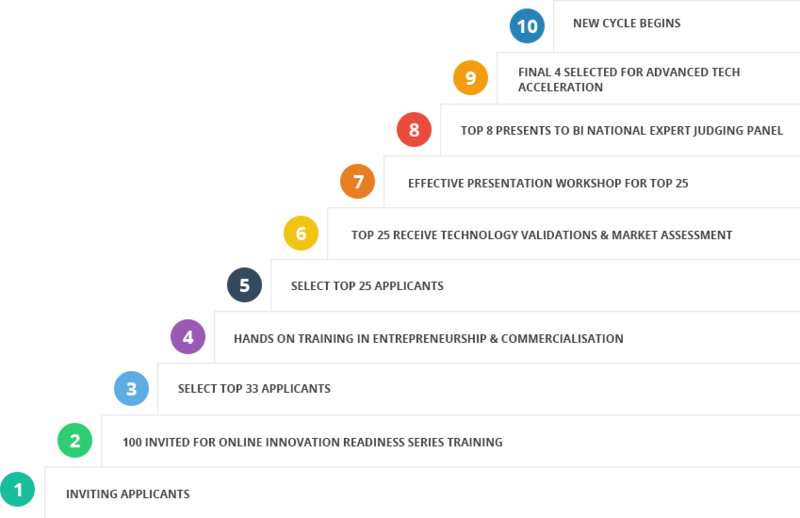 The Innovation Readiness Series® is an online, self-paced training covers each of the key challenges in commercialization. At the end of the course, an innovator will be prepared to pitch an innovation in a compelling and persuasive way to potential customers, partners and investors. Online tutorials for each module provide students a rich interface with the in-depth content on each topic in the series. Videos, quizzes, and assignments on real technologies chosen by participants reinforce the content. Technology description: what are the components required? Technology development status: where are you in the development continuum? Once you have finished the course successfully, a certificate of completion and an eBook of course materials for reference are provided. In most start-up companies, the inventor is the starting point: the disruptive idea drives the development of the product or service. Our training and methodology will define and explain how technology commercialization fits into the research activities of a laboratory, as well as the possible roles that a scientist can play in facilitating the commercialization process. We provide scientists, inventors and lab directors with knowledge and understanding enabling them to support the organization's goals for technology commercialization more effectively. The goal: advance the consciousness level of scientists and innovators as to best practices which can be employed to maximize the value of technology developed in the laboratory, thereby creating a baseline for the role of the scientist in the longer-term commercialization process. We help you draft a plan for taking your innovation to th market, as you define the role that best suits you in the development of the enterprise. In the past almost 40 years, the Institute has been instrumental in generating almost $3 billion in economic impact for the companies with which we have worked, as well as creating over 7,000 jobs in 26 countries. We know how to pitch products to customers and investors — we can help you craft a presentation that will get the attention of investors and customers. Our Entrepreneurship Training program has been designed to benefit representatives of technologies seeking commercialization of their innovation—whether that commercialization avenue is licensing, joint development, or formation of a new business. Training on commercialization strategies, effective strategic management for global market entry, understanding the market and market challenges, venture formation and financing, licensing or joint development, marketing a technology, and bespoke presentation development help fuel your enterprise for a quick lift-off to commercial success! Our goal at XLr8 Andhra Pradesh is to implement the vision of Hon. Chief Minister N Chandrababu Naidu, as articulated in the GoAP Innovation Policy, to have “one entrepreneur in every family." We are collaborating with universities and colleges in the state to provide unique opportunities for students to rub shoulders with real entrepreneurs and market experts, as well as take advantage of selected opportunities for hands-on training and work with our portfolio companies. Over the course of each four-month acceleration cycle, we will be offering seminars and workshops with subject matter experts, from both the United States and India, who will join us to share and impart their advice and expertise. Watch our calendar of events for more soon! Since its inception in 1977, innovation and entrepreneurship have been an integral part of the "DNA" of the IC2 Institute of The University of Texas at Austin. In the past almost 40 years, the Institute has been instrumental in generating almost $3 billion in economic impact for the companies with which we have worked, as well as creating over 7,000 jobs in 26 countries. We have always measured ourselves in terms of tangible economic development and sustainable ecosystems created. In partnership with the Government of Andhra Pradesh and the Federation of Indian Chambers of Commerce and Industry (FICCI), our goal is to recruit, assess and accelerate disruptive technologies, creating measurable jobs and wealth for innovators in the Sunrise State. Our depth of experience in technology commercialization, combined with our extensive global footprint and "know-how network," is the platform to help you position your company for success. Our expert mentors and business development experts will help you developed a bespoke market action plan, and to put that plan into play to attract real business opportunities leading to revenue and growth.